The Boys & Girls Clubs of Chicago is a Non profit organization with 19 Clubs throughout the city of Chicago. The clubs inspire our city’s youth to develop character, leadership, and a willingness to serve their Clubs and community. Every year, the individual Clubs nominate one exemplary member to compete for the title of Boys & Girls Clubs of Chicago’s Youth of the Year. We produced two videos related to this event. The first video we produced showed how the candidates prepared for competition. That video was shown at the event. The second video (shown above) is a recap of the Youth of the Year Award Event, which took place at Chicago’s Navy Pier. We had two of our DSLR video cameras at the event to capture speeches and various b-roll. The finished produced piece included soundbites from many of the candidates, board members, and Mayor Rahm Emanuel. 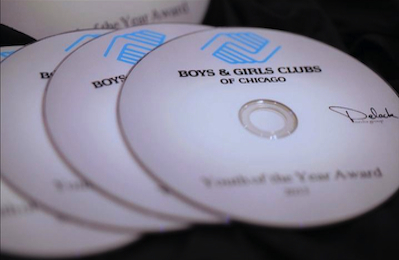 Post production services included b-roll drops of the event video footage to local Chicago television news stations and distribution of professionally printed DVDs with custom motion DVD menus to the organization’s donors. Many of the DVDs included customized video greetings from the candidates to specific donors.